You can increase the number of passes. Initially, it is wise to start slowly. As soon as you know how your skin reacts, you can increase the number of passes. Do not forget to lift the roller after each pass to avoid hitting exactly the same skin channel several times. Yes, you can definitely use a 0.5 mm dermastamp in between your dermarolling sessions. If you plan to use it on your marionette lines or wrinkles, a dermastamp with longer needles is likely more suitable. You can stamp and roll the same area during the same session. Hemosiderin stains (long-lasting rust-color iron pigment left after significant bruising) are very rare and most people will never get them even after serious bruising. If you are prone to them, you would have likely noticed them in the past. Hemosiderin stains are different from ordinary, common hyperpigmentation. Hemosiderin stains is iron that is left behind after other components in the blood have been cleared up after bruising. Hemosiderin stains disappear with time but it can take a year. Ordinary hyperpigmentation is caused by overproduction of the pigment melanin that is normally present in the skin and makes up the color of our skin. Melanin is our natural UV filter and more is produced upon sun exposure. In some individuals, the skin reacts to an injury or long-term inflammation (for example in acne) by overproducing melanin in the area. In certain conditions such as Melasma or Chloasma, the reason why the skin overproduces melanin is unknown. Freckles, age spots etc. contain melanin. Melanin pigmentation usually responds to whitening products such as hydroquinone (the deeper the melanin is in the skin the harder it is to get rid of it). It is very important to protect hyperpigmentation-prone skin from the sun. You can gently pierce it with your dermastamp (use the edge needles of the dermastamp). Do not pierce it deeply, just superficially to be able to squeeze its content out. Just remember to thoroughly clean and disinfect the dermastamp immediately afterwards before using it! Cherry angiomas are spots that are very densely packed with capillaries. From our experience, capillary problems such as dilated veins or cherry angiomas are neither improved nor worsened by microneedling. Rolling over them is safe though, and it won't make it any worse. No dermaroller in the world is worth even half that amount, so the price/quality of that roller is outrageously bad. 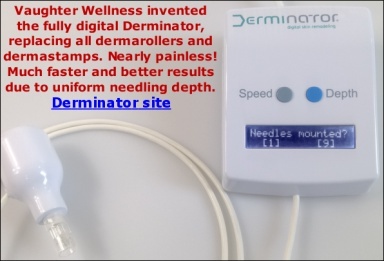 I have written in the past that any dermaroller that costs more than 50 dollars is to be regarded as a scam. I even think that Dr. Roller, a roller we sell ourselves, is too expensive. It is the best roller available, but I think the manufacturer makes a hefty profit. Above that price, there really can't be any improvement, since Dr. Roller is perfect. For the rest - you can judge the quality best since you own one. We do not test crazy expensive rollers, since they're definitely not worth the money. It's like paying $100 for a hamburger. No matter how good the hamburger, it's not worth that much money. I do not believe the Medic8 is as good as Dr. Roller, becasue Dr. Roller is made in South Korea and just about all other rollers in China. But as I said, I haven't tested that model. You only dermaroll twice every 12 days and you only exfoliate twice every ten days. That is a very reasonable and conservative approach. I do not think your skin needs more rest. Exfoliation should not be done overly frequently otherwise the skin does not have time to rebuilt its natural oily film but your exfoliation schedule is very OK. It would be better to pierce it and squeeze out its contents prior to stamping so that it is not pushed deeply into the skin by the dermastamp. The skin absorbs light from lasers and that absorbed light heats up the skin (you can actually cut steel with sufficiently powerful laser light). Everything in the skin absorbs laser light but some parts (for example dark colored parts) absorb it better, especially if specific wavelengths of light are used. Thus you can target for example hemoglobin in blood and destroy (seal) spider veins with heat. With laser epilation, you target melanin pigment in the hairs. Melanin will absorb the laser light and the heat will temporarily weaken or destroy\burn the hair bulb. The problem is that skin itself also contains melanin. It is a pigment that makes up the color of the skin. The darker the skin the more melanin it contains. The skin in some cases can reacts to laser treatments by hyperpigmentation (which is caused by melanin overproduction). The heat simply stimulates melanocytes into overproducing melanin or the skin gets burnt. The skin in some rare cases (in individuals very prone to hyperpigmentations) can also overproduce melanin as a reaction to dermarolling or needling but the hyperpigmentation will eventually disappear. Laser treatments are much more prone to trigger hyperpigmentation than dermarolling because dermarolling does not heat up the skin. You can combine dermarolling or needling and laser epilation treatments but the skin should be healed before you do the laser session. Do a test patch first to see how long does it take for your skin to heal from rolling or needling. If you have very many stretch marks, buy a 1.5 mm dermastamp instead of the single needle because a dermastamp can do it quicker. Yes, you can use shea butter after dermarolling. You can perform the TCA peel in between your 1.5 mm dermarolling sessions. Do not dermaroll with your 0.5 mm roller until the skin is healed from the peel. At first, perform the TCA cross on one scar only to see how the scar reacts (will it not get worse?) but be patient. It can take a long time for the results to show and the same is valid for microneedling. Scars are a difficult problem and what works for one person, doesn't necessarily work the other so you can use a single needle or a dermastamp on one side of your face and the TCA cross on the other to see what works better for you. If they both work for you, you can combine them but wait at least four months after needling with the TCA cross method application. Try the 2 mm dermastamp or use the 1 mm dermastamp every ten days on them. It can take a year for certain scars to improve. I'm sorry - it will disappear but it will take weeks. Your experience is why we don't sell those needles anymore, and have designed better needles. The problem with our previous needles is that the tolerance was too high, meaning that some of them were about 2 mm long or sometimes even longer. We did manual inspection of all of them but sometimes a too-long one slipped through. The result was that occasionally (1 in 100 customers perhaps) there was severe bruising reported and also subcutaneous bleeding. You could perhaps photograph the needle next to a ruler with a camera on macro setting, then you can see exactly how long it is. I suspect you got a too long a needle, or your skin at that spot is particularly thin, or you have veins right below the surface (lack of subcutaneous fat). Our upcoming single needles are all 1.8 mm long. Please do not worry about this. Bruising and the perfusion of blood plasma is strongly associated with dramatic skin improvement, when needling. It will take time for the coagulated blood to be reabsorbed by the body. I do not have more ideas than in my above posting but if your skin is dry and irritated, applying a cream with zinc oxide is not a good idea. Zinc oxide is an excellent protection against sun damage (it deflects UV rays) and it is used for nappy rash where its drying effect is beneficial. Zinc oxide has anti-inflammatory properties but its drying effect can irritate skin that is already dry and irritated. The single needles wil not be ready before December. The factory has promised us "for sure before Christmas" but we have been working very hard to get the needles produced with two factories for the past 1.5 years and also this time it looks there may be complications. As far as needles go, our needles seem to be quite a few steps above rocket science. We still hope and expect to have them for sale just before Christmas though. We are extremely frustrated about the delays but there is nothing we can do. You can combine single needling, stamping and rolling during the same session, no problem. Usually, it is easier first to needle, then stamp and then roll because when the scars get red from the procedure, they are less visible and it is difficult to precisely target them with the single needle so starting the session with needling is the most practical. No, you should not needle or stamp scars that were injected with fillers. Microneedling triggers the deep renewal of the skin and this could theoretically speed up the diminishing of the filler. The filler will be diminishing anyway but deep needling could maybe speed it up. Copper peptides do not really work for pigmentation. You can either try acid peels or a cream with hydroquinone. Or very low percentage Retin-A, applying it with a toothpick on the scars only, to avoid peeling of the entire face.